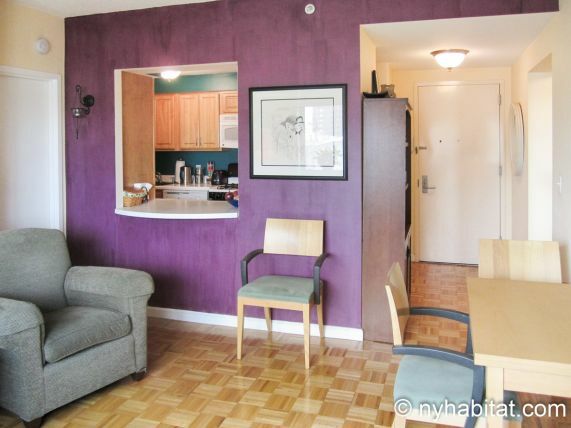 The room for rent is located in a 2-bedroom apartment share on the 9th floor (considered 8th by Europeans) of an 11-story modern building with fulltime doorman and elevator in Harlem, Manhattan. The building has a gym and a garden to be shared with the other residents. 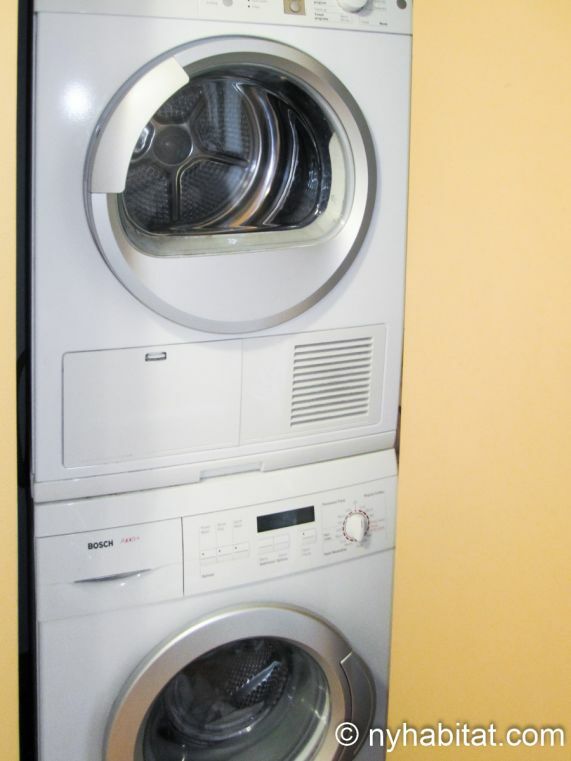 There is a washer and dryer in the apartment and internet access is available. The living room and kitchen are shared with the owner of the apartment. The air-conditioned apartment has video intercom security and a north-east exposure. 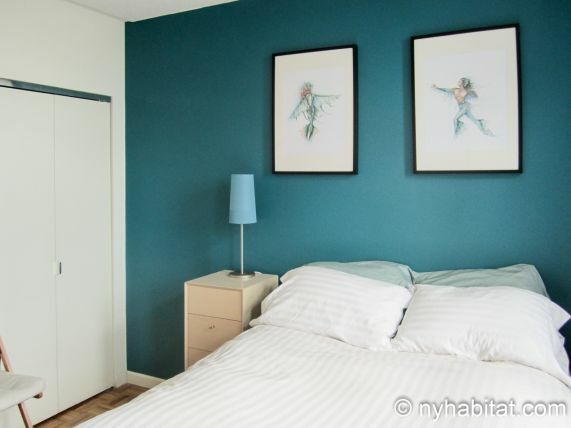 The layout of the apartment is as follows: when you enter the apartment you are in an open hallway leading into the living room with the kitchen to your right. The bedroom for rent (bedroom 1) and your private bathroom are located to your left. The second bedroom and bathroom in the apartment are used by the roommate and can be found to your right. 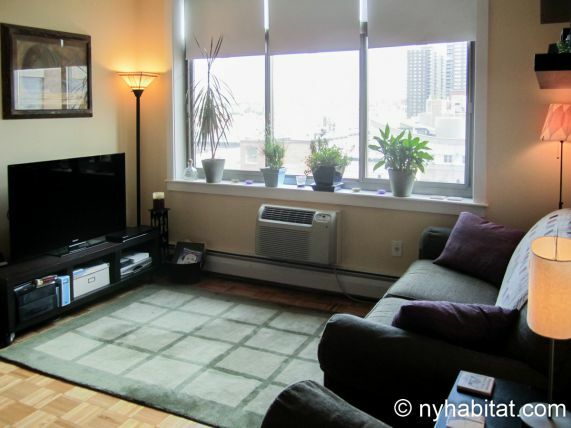 The living room of the apartment has parquet floors and three windows with a panoramic view of New York City rooftops and the famed Yankee Stadium. The room features a comfortable sofa that faces a flat-screen TV with DVD player, and contains a dining table that seats three. 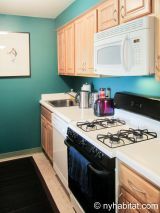 The open kitchen is fully equipped with a fridge plus freezer, oven with stovetop, microwave, dishwasher, coffee maker and toaster. 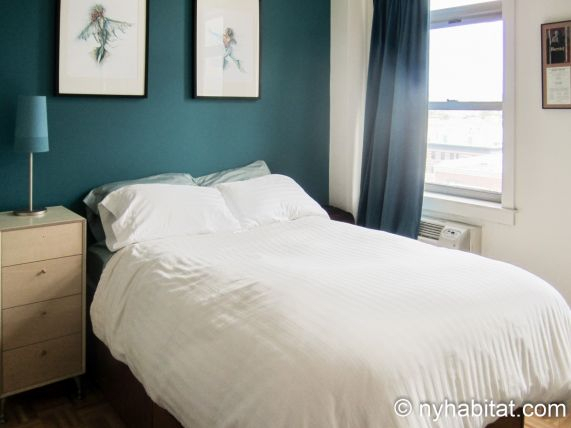 The air-conditioned bedroom for rent has a classic design and two windows with a view of Harlem rooftops. 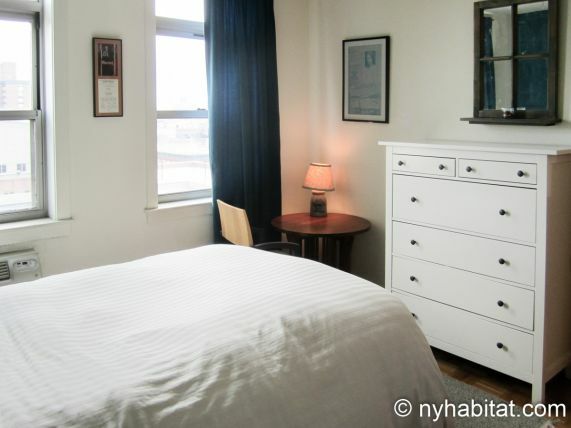 The room contains a double bed, nightstand, dresser, small round table with a chair and a closet. 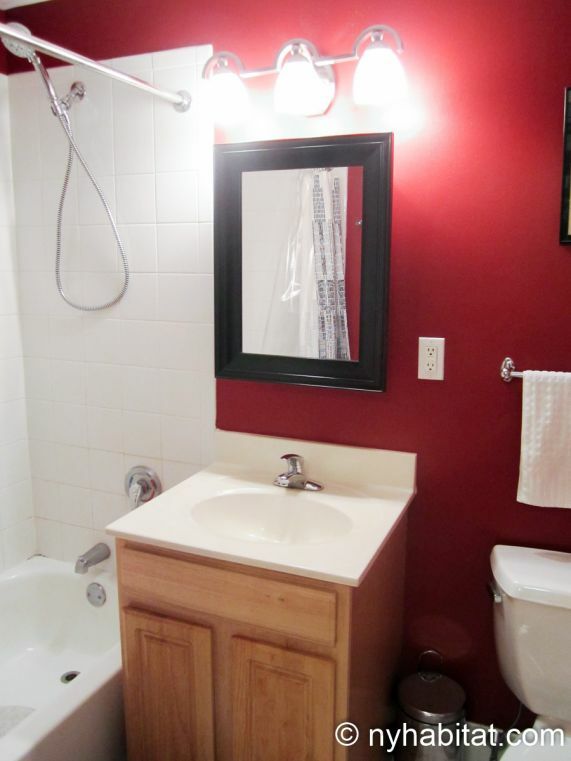 The private bathroom has a striking red wall and includes a washtub plus shower, WC, mirror and washbasin. 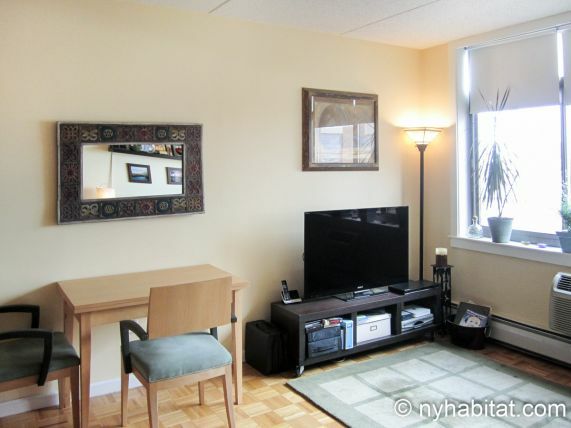 You can find this two bedroom apartment share at Bradhurst Avenue & West 147th Street. Right across from the apartment is the Jackie Robinson Park. The park features an outdoor swimming pool, baseball fields and an amphitheater which hosts concerts in the summer. For a summer picnic, you can also walk about four blocks east towards the Harlem River. At the small esplanade you will enjoy views of the Bronx on the other side of the river, where you can also find Yankee Stadium. For grocery shopping and other food-related business, walk down two blocks from the apartment towards West 145th Street. Here you will find chains such as Starbucks and Subway, as well as little gems such as the Famous Fish Market on St Nicholas Avenue & 145th Street just 4 blocks from the apartment. Here you can enjoy some of the best and cheapest fish & chips in New York. This is also where you can take the subway downtown. The 145th Street station gives access to the express A & D trains and the local B & C trains. Alternatively, you can also walk 4 blocks north-east to 148th Street station to catch the 3 train.